I received a tweet yesterday –“the nip is in the air and the nuts are back”, with a picture of a huge mound of groundnuts with a clay pot kept at the centre. The clay pot is filled with the small pieces of wooden sticks. These are lit so to keep the surrounding nuts warm. It also rained in some parts of North Delhi and the mercury dipped further. To celebrate the pleasant weather, I headed out to Janpath to grab a plate of Crispy kachoris, bread pakodas and samosa. 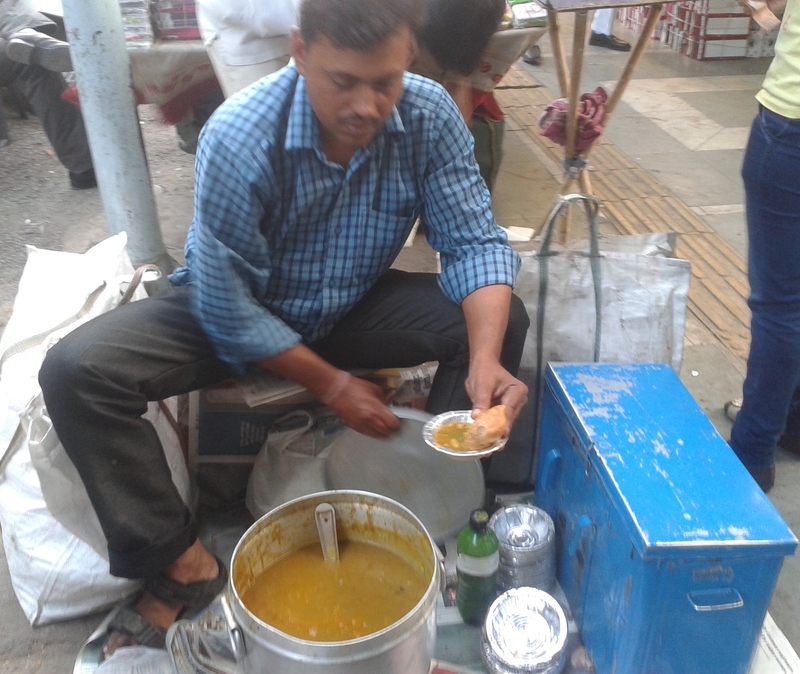 Ranjeet is the man who sells delicious mouth-watering kachoris on the pavement of Janpath. One can easily find him in the morning (9:30 – 12:00) and evening (4:00 to 7:30), sitting opposite Midland Book Shop with a blue box containing kachoris, samosas and bread pakodas, a huge bucket filled with Potato and Chickpeas curry and a half-litre sprite bottle filled with green spicy chutney. All the three dishes are priced at Rs 10 each. I tried each one of them, starting with Kachoris, then samosas and finally bread pakodas. Ranjeet serves kachori in a dona and adds aloo chane ki sabzi to it. He squeezes the sprite bottle to pour some green chutney over it. The kachoris with the filling of lentils were great in taste, crispy and fresh. The samosas and bread pakodas were equally delectable. It’s a good start to celebrate the onset of pleasant winter weather with light crispy kachoris. My next stop is Old Delhi’s Khemchand, Gali Paranthewali, who is back with his Daulat ki Chaat, a delicacy of winter!